Explanation: As midnight approached, a spectacular sky appeared. Such was the case last month from the shore of Lake Salda in southwestern Turkey. 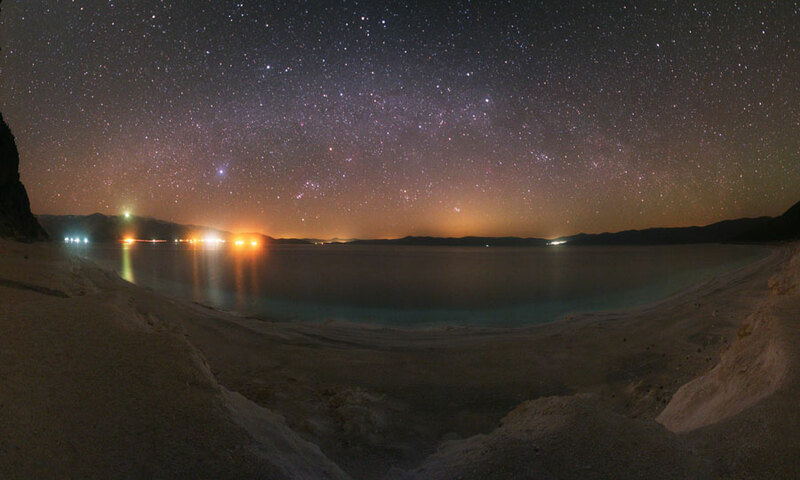 In the above night sky panorama, rocky sand covers the foreground, while building lights are visible across the lake. Looking up, the stars of Orion lie just ahead, while Sirius, the brightest star in the sky, appears to Orion's left. To Orion's right, just above the horizon, lies the Pleiades open star cluster. Arching across the sky is the central band of our Milky Way Galaxy. High in the center, the stars Castor and Pollux are visible. Lake Salda is famous partly for its blue color that is slightly discernable even in the above image.